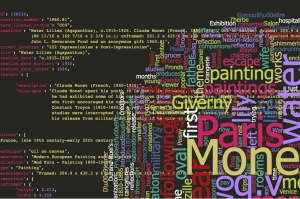 With this metadata offering, we are empowering visitors to create semantic relationships, contextual interpretations, and translations related to artworks in the collection. This makes our collection data easily available for all uses. This collection data allows data scientists to incorporate our collection into their data-visualization and machine-learning projects, allowing our collection data to be a highly sought-after dataset for developers, data scientists, and others around the world. 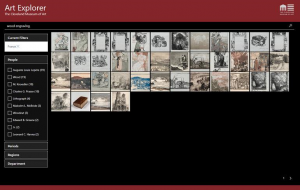 This new search allows users to search the API by fields such as provenance, exhibition history, and catalogue raisonné, providing art historians and enthusiasts alike an opportunity to dive deeper into the collection. Three different views: full-screen image, thumbnail image with increased text, and an equal display of text and image. 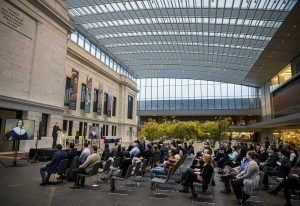 As with our ARTLENS Gallery and other CMA digital initiatives, we offered the most complete and accessible digital package at launch. We redesigned our collection online pages to accommodate the display of over 35 fields of metadata, including descriptive text and provenance. As the first institution to launch an Open Access initiative with CC0 descriptive text, we are empowering visitors to create semantic relationships, contextual interpretations, and translations related to artworks in the collection. The user-experience is always our priority which is why we personalized the online art-viewing experience. Our collection online offers three different views: full-screen image, thumbnail image with increased text, and an equal display of text and image. Finally, a refined elastic search powered by Microsoft Azure makes finding artworks simpler and more intuitive than ever before. This new search allows users to search by fields such as provenance, exhibition history, and catalogue raisonné, providing art historians and enthusiasts alike an opportunity to dive deeper into the collection. Keyword searches also enable users to parse the collection to better understand how subjects have been depicted across time. This feature opens the CMA’s collection for analysis in entirely new ways. A well-documented, public API and a GitHub repository stores all our collection data and allows data scientists, developers, researchers, and others to incorporate our collection into their data-visualization, machine-learning, and innovative research projects. 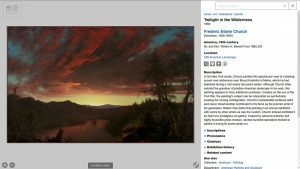 Launching with these tools allows for the CMA’s collection to be included in third-party sites such as Internet Archive, Artstor, Creative Commons, and Wikimedia. All collection data is available in both CSV and JSON file formats. This allows our collection data to be a highly sought-after dataset for developers to use around the world. To build the public API, we added the complex legal rules into code that was then applied to our collection data. We leveraged our existing internal systems, such as our Collection Catalog and Management System (CCMS) and Digital Asset Management System (DAMS), to turn this content outward. Now, when members from the curatorial or interpretation team enter data in the CCMS, the information updates to collection online, ARLTENS Gallery, and the ArtLens App in fifteen minutes, ensuring all artwork content is always up-to-date. 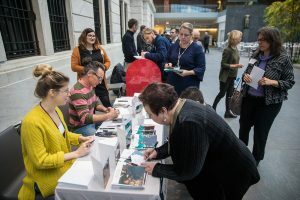 To help demonstrate the possibilities of Open Access, the CMA collaborated with institutions and organizations, such as Wikimedia, Microsoft Internet Archive, American Greetings, and Case Western Reserve University, to spread the access and the impact of the Open Access initiative. These partnerships include art-world, academic, commercial, community, and technology partners. A full list of partnerships is accessible on the CMA’s Open Access home page. 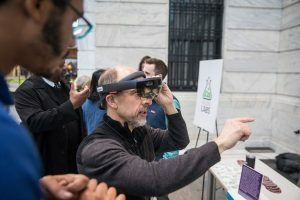 Partnerships are important because they build community while placing our content directly in the hands of users who can create, remix, and share their engagement with the museum’s collections. People around the world have been exploring and sharing our collection in innovative ways. In the weeks since launching Open Access, the CMA has seen increased engagement with our collection from traffic on the newly designed collection online pages to engagement on social media to incorporating our collection into a variety of projects. Our goal of this initiative is not only to give our collection to the world, but also for the world to use the collection in ways that will benefit their daily lives. We will measure this impact over time with digital analytics on the CMA’s own sites and those of our partners. The museum plans to solicit feedback to continue to make user-friendly digital tools. The CMA’s Open Access initiative represents a logical and exciting advancement of the CMA’s mission “to create transformative experiences through art, for the benefit of all the people forever.” We truly believe that there is something for everyone in our collection and Open Access helps more visitors connect with artwork that speaks to them.